Crystal blue waters crashing down on a pristine white beach, while a gentle breeze ruffles through the palm trees. An elegantly draped mandap glistens in the sunshine, while an intimate crowd eagerly watches two people embark on the journey of a lifetime. Sounds like a wedding in paradise, doesn’t it? Destination weddings and cruise weddings hold a certain appeal, and while not feasible for some couples, might be the perfect option for others. Whether a couple wants to share a favorite vacation spot with family and friends, or host a unique and memorable event, destination weddings also offer couples the chance to bring families together for a (relatively) stress-free occasion. Many resorts offer all inclusive service packages, which can ease the burden of wedding planning and infuse the event with the chance to truly celebrate and enjoy the company of family and friends. Planning hikes, kayaking, or canopy tours in addition to wedding events gives the couple and guests a chance to truly embrace the spirit of the local area. Couples are also increasingly choosing to host cruise weddings as the ultimate way to combine vacation with celebrations. With South Asian weddings specialists now on staff at several resorts, South Asian couples looking to fuse elements of a traditional wedding with the fun and excitement of a destination wedding, now have an easier time with the task of planning. So while many hotels and resorts specialize in destination weddings and are well-versed in the décor needed for mandaps and specific ceremonies, couples should still make note of all their requirements. With décor, catering, photographers, among other vendors, all available through in-house services or a resort’s preferred vendor list, destination weddings can be significantly less stressful than planning a traditional wedding. Keeping this in mind, couples should be prepared to ask lots of questions and be mindful of several factors. Budget: Regardless of the type of wedding planned, budget always plays a role. Be sure to consider your budget when looking into possible locations and venues. Destination weddings can be more cost-effective due to a smaller guest count and fewer vendors; however, don’t forget to consider non-traditional items, such as travel expenses, shipping or extra luggage costs, resort fees, travel taxes, etc. Venue: Narrowing the list of potential venues can be difficult, especially when choosing from places such as a Punta Cana, Cancun, or Vallarta! As you research the possibilities, think of all the services the venue offers. Is a wedding planner available? Do they have a backup indoor ceremony location? Can they provide all inclusive vendor services, such as a photographer, decorator, mandap, hair and makeup? Can they meet dietary restrictions and/or is Indian food available? Is a shuttle available for guest transportation? Timing: Be sure to consider the time of year, as the weather might be a factor. Planning a wedding in Mexico during hurricane season is probably not a good idea, so be sure to consult weather forecasts prior to setting a date. Guests: As you narrow your list of choices, be considerate of your guests. From where will they be traveling? Will it require three stopovers and a bus ride to get to your chosen location? Guests choose to be a part of the celebrations and often are paying their own way so be sure to consider the impact of your choices. Local marriage requirements: Be sure to check the local laws about marriage requirements, as some countries require residency or a wait period as well as paperwork. 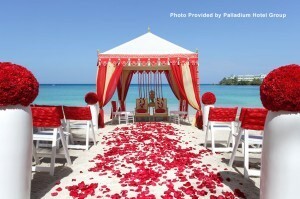 One option is to have a legal, court ceremony at home before embarking on the fun destination wedding! Unlike meeting with all your vendors on a regular basis as you would if you held a wedding in your hometown, a destination wedding requires constant communication via email and phone. Alejandra Carrillo, Assistant Weddings Manager at Barcelo Maya Beach, encourages clients to “speak your mind during the planning process … It is important that you let us know everything that is on your mind and keep the communication going.” As with traditional wedding planning, be clear about what you want, and don’t be afraid to share every detail as this helps your planner ensure your wedding unfolds just as you like. Consider setting up a regular check-in schedule and keep track of your questions so no details are left untouched. Many resorts also encourage a site visit prior to the wedding date. In addition to a site visit, wedding planners at All Inclusive Collection – Hard Rock Hotels send couples a detailed email with information about service options, such as décor and menus. Monica Larcada, Marketing Manager at All Inclusive Collection, asks couples to “take the time to thoroughly review all of the information and catalog options,” so that the wedding planner is able to address all questions during the initial meeting via phone. Destination weddings are a wonderful way to bring family and friends together in a beautiful locale to celebrate one of life’s most special moments – your wedding! With some advance planning, your dream destination wedding could become a reality. Article appeared in March 2016 Desh-Videsh magazine.